Singer S.P. Balasubrahmanyam and Olympic boxer M.C. Mary Kom are among the winners of V.C. Padmanabhan Memorial Awards for Excellence for the year 2018. The Awards carry a cash prize of Rs. 3 lakh and a trophy. The awards were instituted in 2010 to commemorate the founder of the Manappuram Group. They are presented every year to eminent personalities who have made significant contribution in the fields of arts and literature; Civil Servant achieving excellence in public administration; public representative achieving excellence in good governance; business excellence leading to development of society at large, and ecology and environment conservation. A new category called ‘excellence in sports and games’ was added in 2018. Other award winners are: Arundhati Bhattacharya, chairperson, SEBI MF advisory committee & former chairman, State Bank of India; and V.J. Kurian, managing director, Cochin International Airport Ltd. The awards will be presented at a function to be held on June 19 at the Lulu International Convention Centre, Thrissur. Former judge of the Supreme Court Cyriac Joseph will be the chief guest. Ms. Bhattacharya will deliver the V.C. Padmanabhan memorial annual lecture on ‘Modernising the Legacy—My Experiences at SBI. Motivated by the Telangana government’s initiative to support farmers under the ‘Give it up’ scheme, many film personalities are coming forward and returning their Rythu Bandhu cheques to the government. Under Rythu Bandhu scheme, the government gives Rs 4,000 assistance per acre per crop investment to farmers in the State to procure agriculture inputs such as seeds, fertilizers and other inputs. The scheme was launched by Chief Minister K Chandrashekhar Rao on May 10 at Karimnagar, and so far the Agriculture Department distributed 90 per cent cheques to farmers. The government started a parallel ‘Give it up’ scheme, under which farmers or land owners who do not need the investment assistance can return it to the government. From day one of the scheme’s launch many political leaders and government employees opted to ‘give it up’ and returned their cheques. From the past one week famous film personalities such as Mahesh Babu, Tanikella Bharani, SP Balasubrahmanyam and Prakash Raj returned their Rythu Bandhu cheques to government. 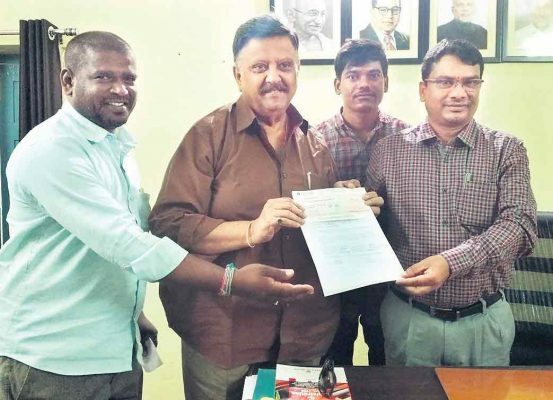 Singer and Padma Sri awardee SP Balasubrahmanyam, who received a cheque for his 5.37 acres at Solipet village of Shabad mandal in Rangareddy district, opted to ‘give it up’ and returned Rs 23,700 to Revenue officials on Saturday. “It is great support to farmers as they can clear their debts with the investment assistance scheme,” Balasubrahmanyam said. Nellore: Veteran playback singer SP Balasubrahmanyam said that they are presenting National Awards to the persons who excelled in various sectors in connection with his birthday celebrations on June 4. Interacting with the media at a private function hall in the city on Tuesday, Balasubrahmanyam said that they are going to felicitate the first playback singer R Balasaraswathi and S Janaki on June 4 by presenting National awards to them. ‘We are presenting awards on every June 4 under Vijetha Arts banner. Not only persons from movie background, we are also selecting others from various sectors who had strove in their respective fields,’ said the veteran playback singer. 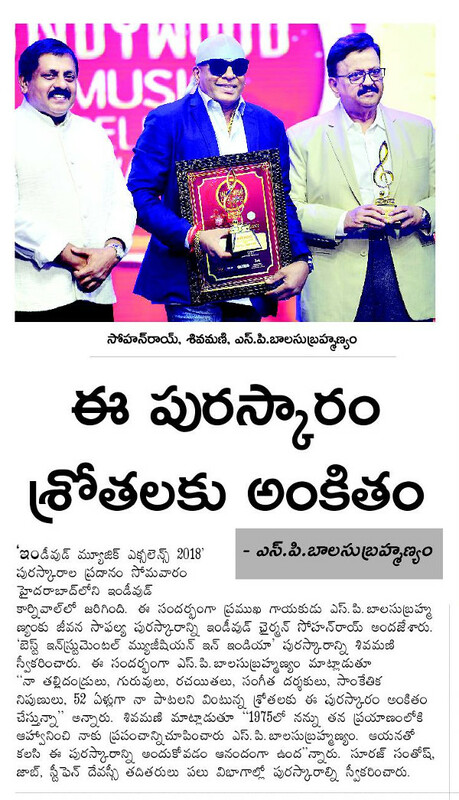 The award presenting ceremony would be held in Nellore Town Hall and cine analysts Rangarao, Music Director Vidya Sagar, lyricist Bhuvanachandra and others will be attending the occasion, he added. Sparsh Hospice, which is coming up with a palliative care facility in the city outskirts, is organising S. P. Balasubrahmanyam concert night on March 31, to generate funds for a novel cause. Dubbed as ‘Sparsh Nite 2018-The Life and Times of SP Balasubrahmanyam’, the concert aims to raise close to Rs 50 lakh for end-stage cancer patients. Sparsh Hospice, which at present is located in Banjara Hills, is undertaking construction of a palliative care facility over an acre of land in Khajaguda, which was allocated by the State government on a 33-year lease. A corpus fund of Rs 10 crore is being raised from various sources for construction and maintenance of the new facility. “Sparsh Nite at Shilpakalavedika is an annual event organised to generate funds for terminally ill patients. The new building itself will cost close to Rs 10 crore and we are trying to raise funds from various sources,” said CEO, Sparsh Hospice, Ram Mohan Rao. According to Rotary Club of Banjara Hills, which manages the hospice, the event will feature Balasubrahmanyam’s sister SP Sailaja, his son Charan, Shweta Pandit, Sri Krishna, Sameera, Revanth, Srinidhi, Ramya Behera Balavika, Rina Kamal and others. Noted personalities from Telugu film industry including director K Vishwanath, actor Daggubati Rana, Allu Arjun, writer Sirivennela Sitarama Sastry, Brahmanandam, music director RP Patnaik, Ali, Mohan Babu, Nagababu, Lakshmi Manchu and others.